Men’s Baseball T-Shirt is in stock. We will print it as soon as you order it. Product printing is good. But material a tad rough I prefer a softer cotton. Not a lot of give in the material as it’s quite starchy. Otherwise it’s good. Great printing service. Delivery service. Return policy good. 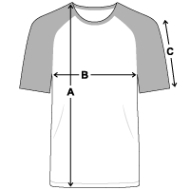 Although I rated the products highly, however we ordered a short sleeve and long sleeve t-shirts. The long sleeve had a hole about an inch long on the side stitching near the bottom, my son has Autism therefore this upset him. Is there anything you can do please, I would be very appreciative. Appears to be of fair quality (Fruit of the Loom brand has quite a good reputation). Will only be able to judge shirt emblem and material colour quality, when garment is washed. Men’s Baseball T-Shirt with H P Lovecraft and Cthulhu image on the front & a small Harbinger451 Logo on the back.